The Islamic State used a 10 year-old American boy to threaten President Trump in the latest video from the caliphate. Yousef warns “Puppet of the Jews” Donald Trump that he will face defeat by the Islamic State. According to MEMRI: Yusuf notes that he immigrated from “America, [the] land of kufr [unbelief],” to the Islamic State with his mother two years ago, and that he is the son of an American veteran “who fought the mujahideen in Iraq [during the Iraq War].” Yusuf says that prior to arriving in the Islamic State, he “didn’t know much about Islam except the name.” The identity of his parents is not revealed in the video. 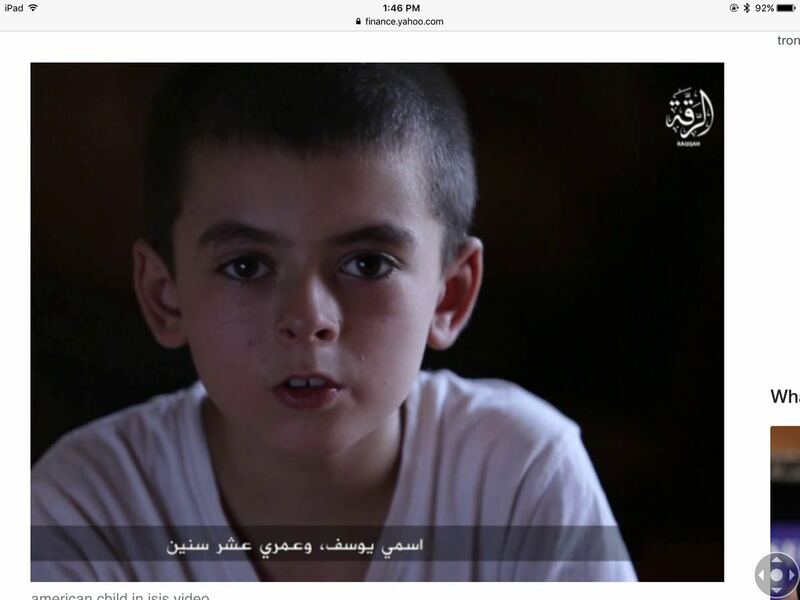 ISIS for the first time apparently used an American child in a propaganda video, a boy living in the so-called Islamic State. Yousef speaks in clear, unaccented English, but his real identity is unknown. Yousef said he moved to Syria from America with his family two years ago. “My father’s an American soldier who fought the mujahideen in Iraq,” he said in the video.